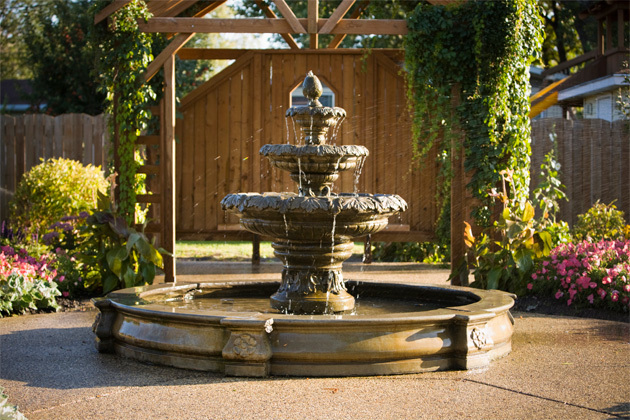 A preformed fountain can be installed with a Berkey Fountain Pump Kit to provide debris skimming, filtration, pump and equipment housing. Optionally the system can be designed to allow for all surface water to disappear underground and into the built-in reservoir when the system is shut off. The end result is a low maintenance system which resists algae growth and minimizes maintenance. In a disappearing fountain, a vertical pipe placement in the pool skims debris from the surface of the fountain pool. A small drain-down hole is drilled at the base of the pipe to allow for the entire pool to drain into the underground reservoir when the system is shut off.